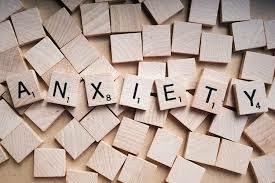 Five Yoga Poses to Help Deal With Anxiety…..
Anxiety can be overwhelming. It’s extremely helpful to have some trusted techniques to help calm and centre yourself when you feel like things are out of control. By taking a few minutes out of your day, you can help soothe your mind and relieve anxiety with these basic, yet potent yoga asanas. These asanas are appropriate for everyone to practice. Try to spend at least 3 to 5 minutes in each. Child’s pose is a deeply restful and relaxing asana. Kneel on your mat, sitting back on your heels either keeping the knees together, or separating them about as wide as your hips. Exhale and fold forward, bringing your head to the floor, or supporting it with a blanket or cushion and laying your hands alongside your torso with the palms up. Release through the shoulders, relax the body, and focus on the breath. If you have difficulty sitting on your heels in this pose, place a thickly folded blanket between your back thighs and calves. You can also use a bolster or thick cushion, which will be hugged in the child’s pose, making it particularly nurturing. The Cat pose nourishes the nervous system and instantly relaxes the body, releasing tension trapped in the spinal cord. It is a relaxing and enjoyable asaanae with wonderful benefits. To practice the asana, come onto all fours with your hands below the shoulders, fingers spread, and knees below the hips. Synchronising breath and movement, inhale as you lower the belly and draw the shoulders together, opening the chest whilst looking up (Cow pose), then arch the back up towards the ceiling as you exhale, drawing down the head to look at the navel, as you move into the Cat pose. Repeat these movements several times making them fluid and slow; mindfully moving through each vertebra with your breath, as if you’re in a moving meditation. You can close your eyes to bring your attention more inward. A deeply relaxing and enjoyable sequence. The ultimate restorative asana, this posture has an unbelievable amount of benefits and will literally put you back together again! If you pick just one asana to practice, let it be this one. Place your mat up against a clear wall with space for you to stretch your legs. Sit on your bottom with the right side of your body pushed against the wall. Swivel up your legs onto the wall as you bring the back onto the floor, keeping the bottom close in to the wall. With the legs straight, relax with your palms, facing them upwards at your sides, and use an eye pillow if that’s comfortable for you, to soothe your mind. Focus on your breath, you can do an equal breathing ratio where you count to five as you slowly breathe in and then count to five again as you exhale. Alternatively, you could do a basic breathing practice of doubling the exhalation. Surrender into deep rest while your body enjoys the healing benefits of this pose. It is an antidote to exhaustion, illness and weakened immunity, relieves headaches, mild depression, anxiety and insomnia. This pose is a deeply restorative pose for the heart, mind and lymphatic system. With your feet a hips width apart, fold forward from the hips, keeping your alignment. Lengthen the front of the body as you fold, keeping the neck and jaw relaxed. Keep the knees soft until you’re more flexible and can straighten the legs. Use props if you need to, such as a bolster to rest your arms on. Release through the neck and the head as you remain in the pose for a few minutes. Uncurling, come up slowly, being particularly careful if you suffer from dizziness or low blood pressure. Lie on your mat on your back, arms at your sides, palms facing upwards, legs slightly apart, feet turning outwards. Ensure that your body is properly aligned and that you feel comfortable. If you have lower back issues, you can use a bolster or folded pillow under your knees. Consciously relax each part of your body, moving up from the feet, legs, hips and so on, just letting go. You can also release tension by first tightening each part of the body, squeezing all your muscles momentarily, and then releasing. Focus on your breath allowing the mind to settle as you come to deep rest. Let your thoughts pass gently as you drop into stillness. Savasana is a lovely pose to practice it is said to be the easiest physical pose but the most difficult yoga pose to master, Savasana, or corpse pose, is where you discover the opportunity to die to life; to surrender completely and to practise letting so. This is hugely beneficial for anxiety, as so often we worry about things that are out of our control. The more we can learn to let go and find acceptance, the easier it is to find equanimity and inner peace. Surrender and enjoy the feeling of deep relaxation, having nothing to do and nowhere to go; just taking time for selfcare and rest. These simple yoga poses can be a nourishing gift to yourself. Practising them regularly can grow into a habit which will bear the fruit of a calm mind and body.